The Second Edition of Religions of Mesoamerica comes at a turning point in the study of the Americas and the religious and cultural histories of the New World. 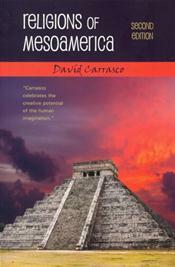 To that end, esteemed scholar Dav.d Carrasco integrates past and current research, developments, and excavations to vividly synthesize the history of Mesoamerican cultures--their religious forms, ceremonial centers, complex social structures, view of time and space, myths, and rituals. Carrasco's deep yet concise overview takes readers on an absorbing journey where they experience the dynamics and complexities of Aztec and Maya cultures, the Spanish conquest, and cultural combinations of European and indigenous ideas and practices. He skillfully demonstrates how the religious imagination was and continues to be crucial to the survival and creativity of Mesoamerica and its Chicano/a descendants.